While the subject of our bathroom habits is usually either brushed under the rug or discussed in the form of embarrassing jokes, it is actually a complex and important area of health that should not be ignored. We’ve talked about healthy bathroom habits and ways to resolve constipation, and today we will discuss the buoyancy of poop in particular. Whether your poops bob at the surface or dive to the bottom can be a sign of many things to do with your health and nutritional status. Here are some of the hidden wellness messages that can be deciphered from the contents of your toilet. A common conclusion in the health community is that floating poops are a sign of poor digestion. When the floating stool sticks to the side of the toilet bowl and is difficult to flush, or an oily sheen appears on the surface of the water, fats in the diet are likely left undigested. So what can be done about floating poop? Talk to a trusted health practitioner about the health of your liver, gallbladder and pancreas, all of which are involved in producing the bile that is used to digest fats. While many sources seem to indicate that sinking poops are preferred, others suggest that floaters are a sign that the diet contains a good amount of fiber. This is because those who eat more fiber, also known as prebiotics, have greater colonies of bacteria in the lower gut. This leads to poop that contains more gases produced by the bacteria. The gases make waste less dense and cause poop to float. Regardless of whether you are seeing floaters or sinkers in the toilet, make sure that your diet contains lots of vegetables, fruit, nuts and legumes to ensure that an adequate amount of fiber is being consumed. The goal is to get at least 35 grams each day. If fiber is a new thing in your diet, start slowly! Otherwise the number of bacteria feasting on all that fiber may increase too quickly and cause digestive discomfort. Some experts believe that floating poops could be a sign of celiac disease. Gluten leaves the gut inflamed and unable to digest food properly. Stools may float and be grey or tan in color, and have a foul odor. A particular concern is if you see floating, soft, diarrhea-like stool frequently or for an extended period. If this is you, consider getting tested for celiac disease, or better yet, simply decide to eliminate gluten from your diet! On the other hand, sinking poops can be a sign of chronic constipation. Constipation can occur when a person doesn’t have enough digestive motility (i.e., the intestines are not working to push the waste along). There are many causes of constipation, such as poor diet, anxiety, lack of exercise and not drinking enough water. Common solutions are to drink more water to help hydrate the bowel and the stool, take magnesium supplements to relax the intestine, and use herbal remedies such as aloe vera juice and cayenne pepper, which are known to improve elimination. 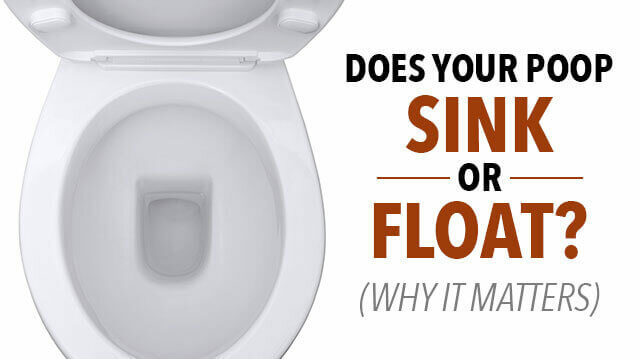 Does the floater vs. sinker debate really matter? Eliminate at least once per day (but not more than three times). Have poops that are smooth and about the shape of a banana, not too hard and not too soft. Color should be an even medium brown with no visible bits of food, fat, blood or mucus. Smell should be fairly neutral, not overly unpleasant. The more points you answer “yes” to above, the better your poop health is! Ideally you will experience a mix of floaters or sinkers on different days, along with some that just hover in the water and don’t go to either extreme. How does your poop stack up? Make sure you take a moment to check it out next time you go! If your toilet habits need a little upgrading, try these smoothie recipes that help promote good poops. Previous articleTV May Actually Kill You — Really?! Hey Buddy!, I found this information for you: "Does Your Poop Sink or Float? (And Why It Matters)". Here is the website link: https://www.thealternativedaily.com/poop-sink-or-float-why-it-matters/. Thank you.